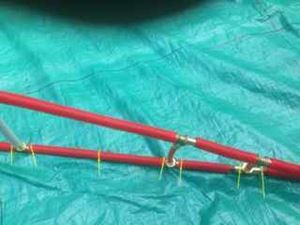 The forward part is made out of two Clark Y extrado profiles, one on port and one on starbor, crossing at 70% of the cord. 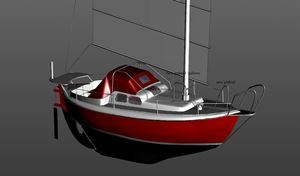 The rear is a flexible batten that is hold by two sheetlets. 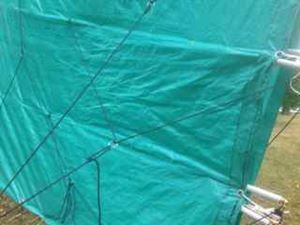 The skin (Polypropylene cover) of the wing is fixed to the armature via electric plastic bounds. The battens are very mold. 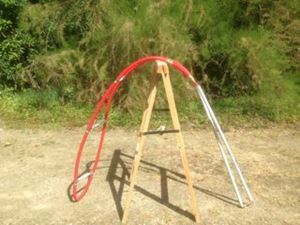 I used electric wire tubes to reinforce the rear part (to the right). The forward part (to the left) is hold flat by the skins. The yard is a PVC waste water pipe. The skin is passing around the tube to build the top forward profile. 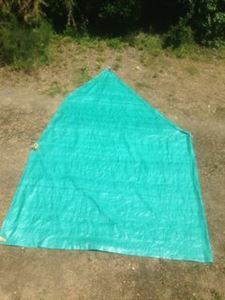 The two layers of skin are cut from a cheap thin polypropylene cover. 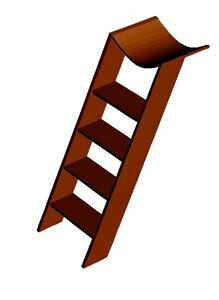 A batten with diagonal stiffening stantion. The rear part (up) in position as on port. 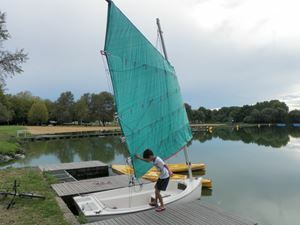 A trial on a lake with almost no wind. We succeed sailing! 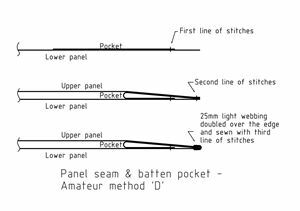 The lambda sheeting with the two sheetlet one at the end of the batten and the other at the hinge area. 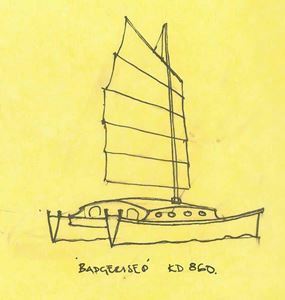 This is a v quick sketch of a Bernd Kholer KD 860 overdrawn in the style of a Badger. New rig for Shoestring part a. 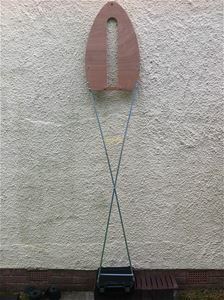 Fan shaped sail, carbon fibre mast set forward of current position by 1 meter. mast in tabernacle. New rig for Shoestring part b. Once again a carbon fibre mast in a tabernacle as in part a. 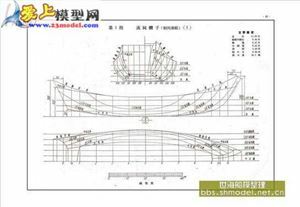 Very simple sail shape probably with camber. 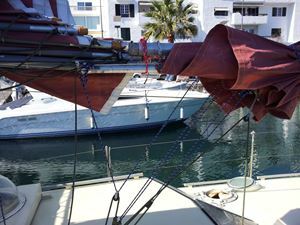 Mizzen mast off set and can be lifted out easily. New rig for Shoestring part c. Current pine mast height position. 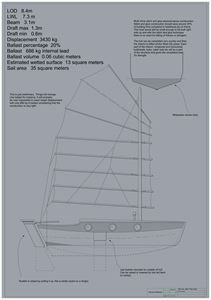 Dhow/ Junk type rig. Double sheeting. 10 metre giant bamboo battens and probably weed-mat sail material. 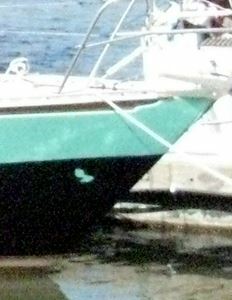 Lower panel can be reefed up. 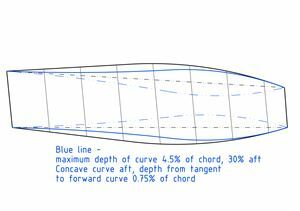 camber intended 10% but emerged at 7% positioned at 40% aft of main's luff. Leach of jiblet is tight and luff of main loose so alterations in hand before the simultaneous tests. 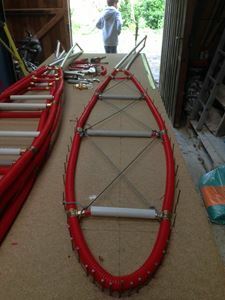 Split Junk under construction.The batten length of the 'main' is 1450mm, slot 110mm,jib 440mm. 10% camber designed. I made the Jib leach too tight so it will be altered . 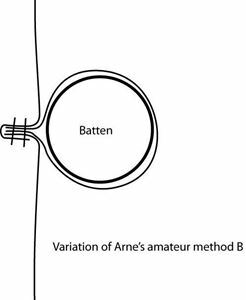 Arne type panel, B= 2000mm, P= 500mm 10% camber designed. Came out a bit less. 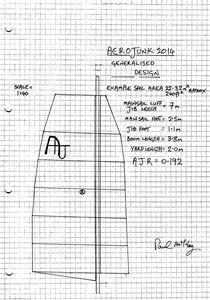 Length around the curved side with 'R' included was 2040mm, so 5 darts, 5,10,10,10,5 were inserted in area of camber. 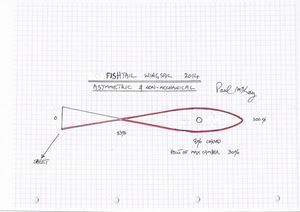 5 'Broad seam' darts inserted to try to keep max camber well forward and to allow neat batten pockets. All construction supervised by Battersea Jack who does have a head. 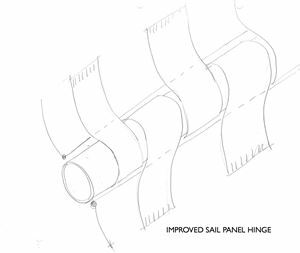 FishTail batten. 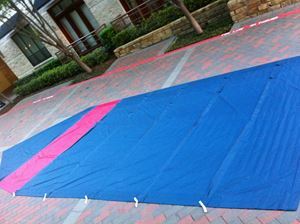 This one is 2.5m long x 0.4m wide. The nose is 1/2"ply. Aluminium tubes are 1"x1/2". 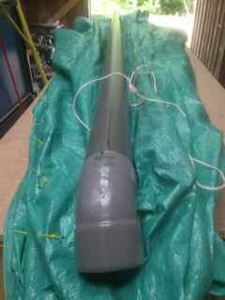 The cross tube is made from a piece of 15mm plastic water pipe. 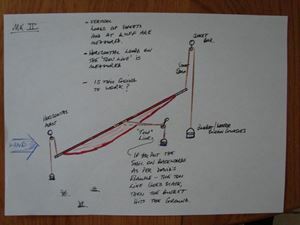 Donald Ridler's sheet to tiller steering on Erik the Red. 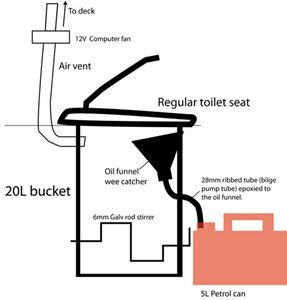 Composting head for thread on the General forum. The hand-stitched patch. Homeward-bounders in order to get sailing again asap. Close-up of the Odyssey fabric showing how easily the cloth has torn. The tear on the leach of Fantail's Odyssey sail. The second panel up of Tystie's fanned sail, re-cut to remove excessive cloth and camber. 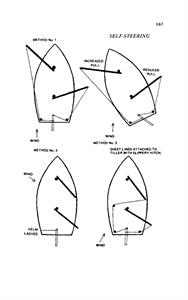 Breakdown of the cloth in the second panel from the bottom of Tystie's sail, due to flapping when the two lower panels of the sail are reefed. 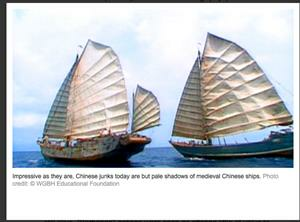 Traditional Junks with 'junk jibs'. 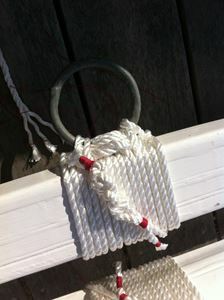 Yard lashing for hauling ring. Yards are Douglas-Fir with kevlar roving set in a double groove down each side. Line is 1/4" polyester three-strand, seized and whipped. 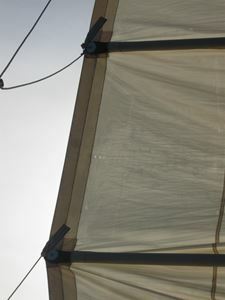 Another view of the mainsail, showing tabling detail and pocket ends. 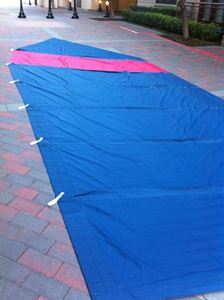 The mainsail, stretched out after sewing. 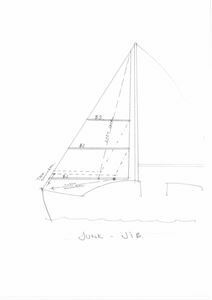 Sail is approximately 12' 3" by 33' 1". Batten angles are 10,10,10,12,14,17,22,60 degrees. Fabric is Odyssey III. I've added grommets at head, foot, luff. 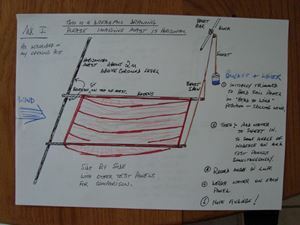 Sketch of a batten pocket layout for a long-distance cruising sail, to be assembled panel-by-panel. Making oculi, stage 2 - white castings propped up so that the recess in the bottom is level, and black-pigmented polyester casting resin poured in. Making oculi, stage 1 - PP bowl, 4 oz of polyester casting resin with plenty of white pigment and white microspheres filler. Bowl tilted so that the pupil is to one side of the oculus. 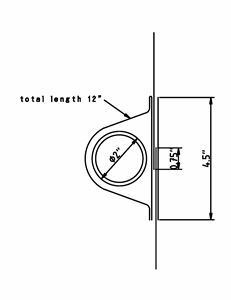 Hull aperture for Footprints' outboard well and anti cavitation plate above the prop. Almost like a sail drive unit. 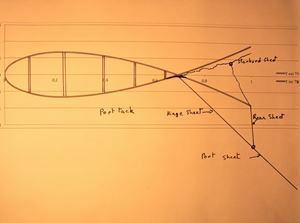 The long skeg beside the motor may also help direct thrust. 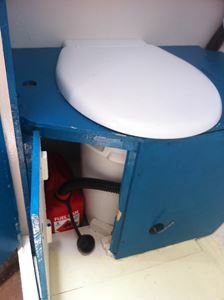 Outboard well to right of cockpit (actually port side) with cover down.